So after my little crisis on Saturday (Thanks Fancybiscuit to coming to my rescue!) yesterday was very good. After church we headed over to Cambridge to meet everyone at LB’s House. We headed into the centre of Cambridge to grab some lunch to celebrate LB’s 25th Birthday. We went to the Leisure Park – which is the same bit as the Junction so having never been before I went twice in one week to the same area! We went to Chiquito’s for lunch, I’d never been before and would have probably preferred Bella Italia or Nandos but it’s LB’s birthday so she gets the choice. We arrived at 2:06pm and was seated at about quarter past – no problem, but then we spent 40 minutes waiting to have our order taken (it had taken between 20 and 30 to actually be handed menus). The restaurant was practically empty so I’m not sure what took so long. When our drink order had been taken the girl who was serving us disappeared behind the bar (which we could see from our table) then a group of her friends arrived and she stopped sorting our drinks to have a chat, we’d already been there nearly an hour so something had to be said. We ate dinner which I think everyone enjoyed – I ordered a Chiquitos Classico Burger, the burger was fab but I only seemed to get half a portion of chips and seeing at it was past 3pm I was famished by this point! We decided to have pudding but really wished we hadn’t made the effort now. Me and LB both had a Belgian waffle thing which was fine (£4.49 well worth the money we paid for it), but everyone else round the table were not happy – they’d ordered a sundae which cost more than our waffles but was really not worth the money. This is what Chris received (excuse the fact that the whipped cream on top has half disappeared Chris was already tucking into it before I took a picture lol). Kewey and Serena asked for theirs without whipped cream on top so it was even more disappointing for them. When the bill arrived we’d worked out that it was about £20 a head but that wasn’t worth it given that 5 of the 7 of us hadn’t really got a proper pudding. So I was nominated (I think it came down to that I work in Customer Service therefore I know my way round the conversation lol) to go and speak to the waitress. All in all this was a huge fail as the customer service was rubbish. In all honesty it kinda wrecked LB’s birthday – the manager was rude, the food was below par for the price and all in all this was a bad experience and if I’m in the area again I’ll go to one of the other restaurants in that stretch. There’s Bella Italia, Nandos, Subway and Frankie and Benny’s all in a row – I know I’ll be going elsewhere. I even tweeted during the meal that the customer service was bad – so far I’ve not heard anything back having tweeted them once during the meal and again today while at work to get an email address to send a complaint. At present I am going to write to the head office and to the branch. That is TERRIBLE! We had a bit of bad luck at my birthday dinner yesterday and as my husband was getting up to go talk to the manager I interrupted and said I would do it. His words to me right before I left the table were “You enjoy the satisfaction, don’t you?” I giggled! I LOVE confrontation… so we had all of my dinner sorted out INSTANTLY. 🙂 I wish I could have been there to do this for you as the woman who ran the joint would have been apologizing and reimbursing you for dinner in full. Hehe I’ll be sure to take you with me next time! I don’t really like confrontation but I used to be a waitress and now I work in customer service and I guess kinda expect a certain level of service right? The manager being rude was just rubbish. I’ve emailed the company who own the restaurant and they are going to take it up with the manager of the branch and get back to me about what can be done further. Gah, that sundae looks a bit naff. Having never been to Chiquitos I’ll avoid it in future! The main course was okay just had a lack of chips. 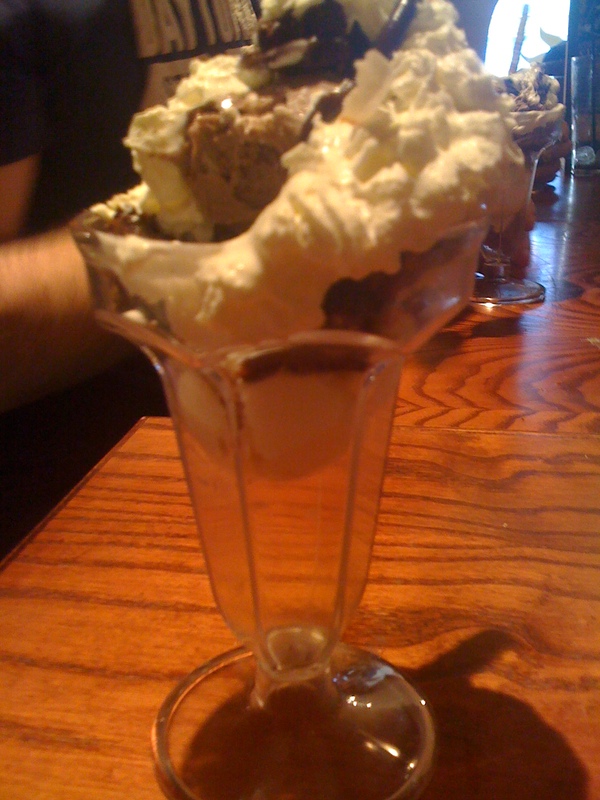 My fudge waffle was lovely and I’d have that on it’s own lol it was the sundaes that let them down and the service.